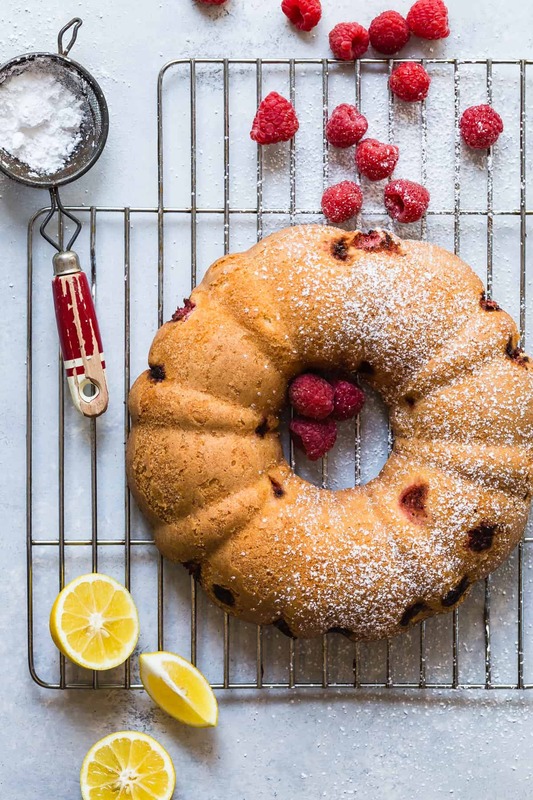 A lemony Bundt Cake studded with raspberries and dusted with powdered sugar. 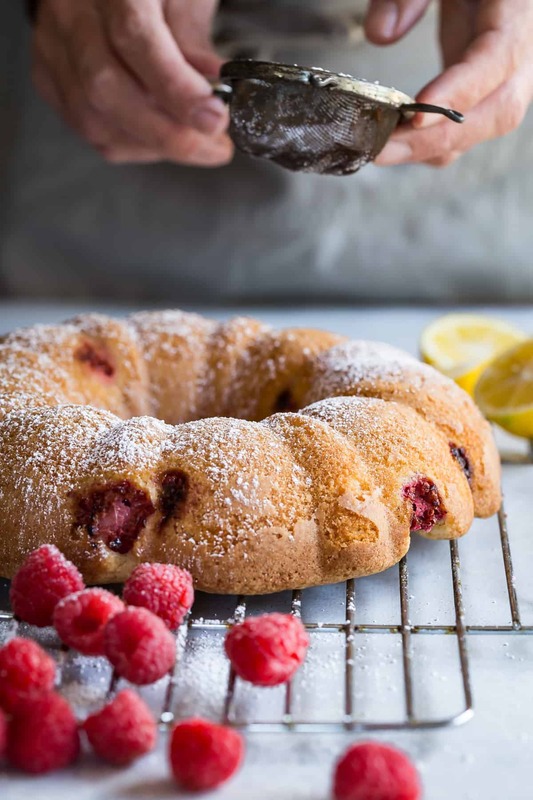 This is an easy summer dessert and smaller than a regular bundt cake! Every time I hear the words, Bundt Cake I’m always reminded of the movie, My Big Fat Greek Wedding. And a classic movie needs a classic cake. Am I the only person who’s terrified when it comes to releasing a bundt cake from its pan? Seriously, I’m always waiting on half of it staying behind and half landing in my shoe, but so far all my bundt’s have popped out perfectly. 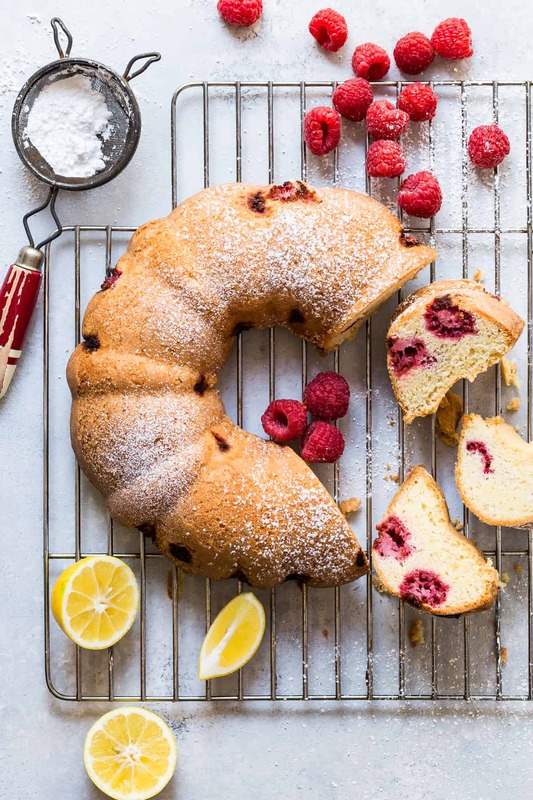 This bundt is smaller than normal size, meaning it’s just not as high and that means you can eat infinitely more pieces without any guilt, right? I didn’t plan for the cake to end up this size but I decided to keep it as is. It has the awesome lemon flavor I was looking for and it still looks like a bundt! And lemon and raspberries, who can say that combination doesn’t go well together. I’ll argue with you until the cows come home on that one. You score some tartness from the lemons and then the raspberries throw some sweetness your way. It’s the best!! I was lucky to make this because if my son ever finds fresh raspberries in the fridge, he’ll inhale them so quickly which I’ve learned to quit whining over even if the price is close to five dollars. I’d rather he had a tummy full of fruit than some other stuff. Although too many raspberries make for tummy thunder, if ya know what I mean! 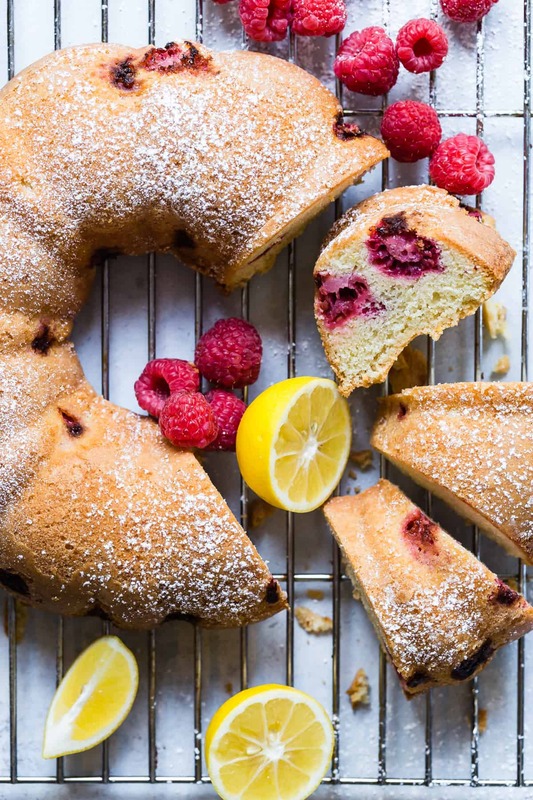 a moist lemon raspberry bundt cake perfect for summer days! In a bowl mix the flour, baking powder and salt. Set aside. using a stand mixer beat the butter until creamy. Add the sugar and continue mixing on high speed for another 3-4 minutes. Add the lemon zest and vanilla and mix. Add the eggs one at a time beating well and scraping the sides of the bowl. Add the lemon juice and gradually add the flour. Mix well to create a smooth batter. Take the mixing bowl from the machine and fold in the raspberries with a wooden spatula. 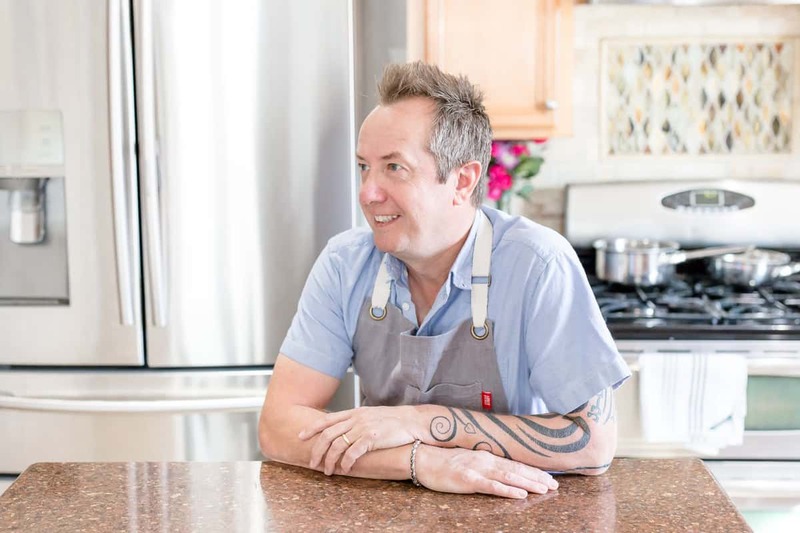 Preheat the oven to 350 degrees F. Line a bundt pan with non stick spray or butter. Add the cake batter to the pan and spread out evenly. Bake in the oven for 35 minutes and a toothpick comes out clean when pushed in. Make the glaze by bringing the water, sugar and lemon juice to a boil and simmer for 3-4 minutes. Use a party brush or spoon the glaze over the bundt cake. I wonder if this would make a full size Bundt cake if the ingredients were doubled… possible? In any event, thanks for what looks like a very tasty treat, indeed! Refreshing and perfectly sized for s small family ! Thank you so much ! 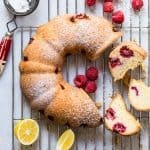 I love the simplicity of this cake and I love how it has two of my favorite spring flavors, raspberry, and lemon!